Cool little experience, I dig the PS1 aesthetic. Thanks for hosting the jam! I have a pretty big nostalgic attachment to the old Nokia games, and I had thought for a while now that it would be fun to make one like them, so I couldn't pass this jam up. The dialogue is only possible thanks to the surprisingly legible 3x6 font by Daniel Linssen, a really talented itch.io game/asset creator. Unfortunately, the rendering of the text does display some faint artifacts around each letter, which I think is a side-effect of forced text smoothing, either by Phaser.js (the framework I used) or the browser itself. I actually spent a lot of time trying to fix that, but was never able to. As with most jams, even though I couldn't finish all the features I wanted, it forced me to create a good base for a potential full game, which is always a good thing. I'm glad the participation numbers exceeded your expectations, and that so many great little games came out of it. Im also super impressed at how well I could understand the 3d space with only 2 colors. Kind of reminded me of the old Windows maze screensaver. This would have been an awesome game to have on an actual Nokia 3310! The sound is also really authentic. Well done! Super funny idea! And a really creative take on an old game. The simple omission of that one basic rule makes it so much more intense and funny. - When the game ends and it shows "Player 1 (or 2) wins! ", it should stay up for at least a minimum of 1 second or so before you can dismiss it with a button press. If both players are spamming buttons to place their pieces (which they should be), it's virtually impossible to see who won. It also might be cool to keep track of how many times each player has won, since the games go so quickly. - It's possible to just create a really quick row from your starting position just by moving left, right, right. This makes it a little cheesy, and discourages you from interacting with the other player. Some ideas to help this are to maybe randomize the starting position of each player, and maybe allow both players to be over the same space at the same time? Definitely one of the more clever ideas I've seen so far! Thanks, I'm glad you got a chance to check it out! And thanks for hosting the jam, it was a lot of fun and it's been great to see all of the games that came out of it. Thanks for your gameplay suggestions. 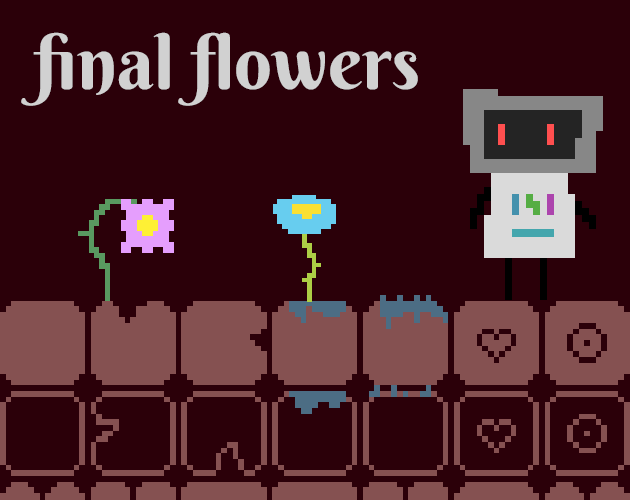 I think those are all good ideas, and I'll definitely consider them as I work on a post-jam version. And thanks so much for your compliments. I'm glad you thought it was fun (since that is the whole point!) and enjoyed the piano. You've really made my day by saying you'd consider purchasing a polished version - that is a long time dream of mine. Your kind words will help me as I work on making the improved version of this game the best it can be. One of the more abstract games I've seen in this jam. It almost felt more like an interactive experience than a proper game, and that's not a bad thing. I usually don't like when where are no clear instructions or objectives, but in this case I think it really worked. Like LostPenguin said, I think that was part of what made this experience, especially since the game was so simple that you could quickly & easily figure it out. Cool concept here. I agree with others that the idea of losing screen space as you take damage was a great idea, but it was a bit too forgiving with the positioning, which made it almost a non-issue. Some repositioning of the cracks would make this a lot more effective. There were a decent number of object interactions (spinning blades, arrow traps, and springy things), though you could have used the arrow and springs a bit more. The rooms were a little too easy I think. Especially the last room, where you can just go around the maze of spinning blades. This was wonderful. The visual style here is my favorite that I've seen so far in this jam. Very unique and full of personality and style. My favorite parts of the visuals were the animation of Alexa walking with her doll, and how the music box would spin while it played. The gameplay is overall pretty simple. The fact that there's no real "win" condition makes it a bit more interesting, however, and it amplifies the theme a lot. The two special items, as well as the little messages that accompany their discovery, add a ton to the emotional connection you have with Alexa, and makes you want to keep her alive (and makes it that much more painful when you can't). My only complaint here is the collisions would sometimes block Alexa from moving. Specifically, I couldn't get close enough to the couch to get the bag of chips that were sitting on top of it. This is a great example of beauty in simplicity. Despite the simple controls and extremely simple visuals, this game is a lot of fun to play. Gaining speed, zipping past blocks, and drifting around corners feels so good! The music is also super dope. It makes you feel cool, it's kinda funny, and it fits the retro racing action really well. My main issue is that the camera was so zoomed in, it made it sometimes impossible to dodge blocks. The Web 0.2 is a lot better about this, but I think having even more distance from the edge of the screen would be beneficial. I thought this was super fun. The core gameplay is actually a really fun sort of puzzle-platformer without any jumping. One of the more unique gameplay concepts I've seen in this jam. The level progression was also very smooth. You taught concepts and tricks through the levels naturally, and built up to some pretty tricky levels that felt satisfying to overcome. It took me a while to realize that I was dying from hunger (I thought it was a bug at first), so maybe some sound effects would have been nice there. I couldn't figure out what to do after collecting the Lotus Flower - or even if I DID actually collect it, since when I swung the bottle at it, the bottle didn't seem to contain it, and the leaves of the flower made the same animation if I slashed at it. I also couldn't figure out what the purpose of the gems were. However, the movement was very smooth and felt nice to control. I really like the idea of equipping two items to two different buttons. The sprite / animation work was very visually pleasing; I particularly liked the enemy sprite, and the animation of the grass being cut. The characters avatar changing depending on what items were used is a really nice touch that adds a lot of charm. Super difficult, I gave it about 30 tries and only ever got kinda close. I would be really interested in seeing what the strategy is for winning here (it's gotta be spraying back and forth... right?). I really enjoyed the visual style: the simple art, color schemes, and scan lines were all very pleasing to the eye, and gave it a cool 80's arcade vibe. I'm not quite sure what the green lines were, though. I agree with others that WASD was a bit confusing. Also, it is possible to hold the mouse down and simply hover over the falling paws to make them disappear. Maybe check for the initial click only? Other than that, this was a lot of fun and I see a lot of potential here. I really liked that each mini game used a different control scheme (keyboard then mouse). I can picture a longer game where you spend the whole day playing with your cat, using a bunch more minigames for a variety of activities. The art is very good, specifically the little screens on the top left during the games. The art / style is the real standout here (I liked the little hearts in the cat paws). This is a pretty nice game with some good potential, but some fatal flaws really prevent it from reaching that next level. + Concept and theme is pretty tight. + Core gameplay is overall fun: finding the buttons, using the pads, finding the door, getting chased by the org thing. + Art and sound is very well done. The lighting is super nice, especially how shadows cast themselves around corners as you move. - Unclear final objective. Once you get to that room with the 4 like, dark pads(?) and the ball chasing you, it is really not clear at all what you are supposed to do. The only thing you are taught before you get to that room is to find buttons, use blue pads, and avoid the balls. But there were no pads or buttons, and the dark pads seemed to not do anything. - Because of the above, and the fact that the game sent you back to the beginning when you died, it didn't feel worth it to me to try and figure out how to beat it, since it was annoying to have to run through the first part of the game all over again. Because of this, I never beat it (even tough I really wanted to). - Once the light radius shrunk to a certain size, it was basically pointless to try and move since there was no way you could find your way around. So this resulted in, after a certain point, you would just sit there for a good 6 or 7 seconds while you waited for the light to refill itself. The light refilling automatically also completely removed the anxiety of trying to find the pads (but I get why you did it). I'm not sure exactly how, but some type of balancing would help with this. - Super minor gripes: Collision was a little but janky around the edges, and the black sections of the floor made it seem like some textures didn't load. I'm glad you enjoyed it! If I ever get around to creating a more complete version of this, there will definitely be some difficulty balancing. Wow thanks! There are some great HeartJam games, so that means a lot. And I'm glad you discovered the bomb jumping, it's a lot of fun isn't it? Hilarious concept. A unique little puzzle with a surprising number of levels to play. Good job ! Thanks for checking it out! Yeah, unfortunetly I didn't have too much time to get play testers or anything, so I adjusted how quickly the air depleated a few times based on my playing alone. It's tough to tell how to balance it, since I got so used to playing efficiently. Something I plan on fixing if I make a proper full version of this. I really liked this. I wish I had found this back in October! itch.io Community » Game Development » Release Announcements · Created a new topic Donut Boy - A dinky platformer with projectiles. My first ever game! This is Donut Boy, my first ever game. You are tasked with saving the employees and donuts that were scattered around town due to an explosion at the donut factory you work at - but the game is not very story heavy. It's a simple platformer where you can find several weapons to use, and a bunch of characters to play as. There are 5 levels, each with it's own theme, and your progress is tracked and saved so you can see what you need to find in each level.